The countdown timer has struck zero and British Pie Week 2016 has begun – so what more motivation do you need?! Grab a pie, make a pie, tweet your #PiePledge. Here’s some things you can do this British Pie Week! As for the Pierateers, we are ready and waiting for probably the biggest British Pie Week yet! All the Pierateers have made Pie Pledges of some sort for this week, showing their commitment to pie, plus this year the ground breaking news is that the British Pie Awards 2016 are taking place a month early, to coincide with British Pie Week! We'll be there as judges and media to cover the event! It seems this year, more than any before, people are bigging up British Pie Week. Plenty of pubs and shops are doing something special for British Pie Week and even Jus-Rol, creators of British Pie Week, have got on board more with a dedicated @BritPieWeek Twitter feed running for the second year! And while we may not have the amazing Pierate Logo pie to enjoy this year (right, made especially for us by Nice Pie in 2014) we have already got some more of their pies to rate and are certain there will be plenty of other pie antics this coming week! Especially if our crazy #PiePledges are anything to go by! You know it's British Pie Week when you're trying to balance how much pie to eat for brunch before eating pie for lunch too! But there's worse things to have to balance in life, so I decided to go for just 2 pies for brunch before I head to Cardiff to pick up some pies later as part of my #TriPie pie pledge. Having already stayed up just past midnight to complete our Pierateers Pie Pledge article, I couldn't resist kicking off British Pie Week with a Mr Kipling pie. Being over 5 years since we first rated these national institutions of the pie world, we'll be re-rating them this pie week! For brunch I had two pies from Nice Pie - who fans of Pierate will know have produced countless Pierate Highly Recommended and Pierate Recommended pies! The pies I ate and rated today are the Steak, Ale and Stilton and the Braised Beef, Roasted Onion and Cheddar Pie! As I only had a few hours in Cardiff, I had my eyes on the pies from the start, heading straight down to Clarks Pie Shop on Bromsgrove Street, a 20 minute journey from the train station. While I was too late to get a hot pie for my lunch (serving ends at 1:30pm) I was kindly let in the back and given a bag of pies after a chat with Paul, just back from a delivery round, and Amanda. They were very friendly, giving me a bit of the history of the 100 year old pie business and informing me about their pies, which are sold in many chip shops and convenience stores in the area. I just managed to pick up a Peters pie, also baked in Wales, to eat cold while heading on the train back to Birmingham. It was also great to see that #BritishPieWeek was trending throughout most of the day, helped I'm sure by the shout out on BBC Radio by huge pie fan Chris Evans but also by the many pie companies and pie fans up and down the country! This British Pie Week, I have pledged to perform the "7 x 7". That's eating 7 pies a day for all 7 days, which means a tasty 49 pies for the week! According to my own rules, I am allowed to eat the pies at any time of day as long as I've eaten 7 pies by the time the clock strikes midnight. Therefore my tactic was to spread the pies out evenly throughout the day, rather than having to eat all 7 in one go at the end of the day. So it felt very good to get 2 pies under my belt for breakfast, as I was already over a quarter of the way there! My breakfast pies of choice were 2 Juicy Cherry pies taken from a 6 pack of Mr Kipling "Fruity Pies". This delicious sugary hit really got me going for the day, and certainly put me in the mood for British Pie Week. For lunch this week, I had been planning on relying on my local Eat store for hot pies. However, having discovered it had shut down last week, I instead headed out to try Castle's Pie and Mash in Camden Town. But then on arriving at Castle's, disaster struck: I found it was shut on Mondays! My back-up choice was going to be Battersea Pie Station in Camden market, but unfortunately I didn't have enough time to walk there. So instead I quickly explored the local cafes trying to find a pie but had no luck. In the end I settled on two pork, pickle and cheese pies from the deli counter in Sainsbury's, and picked up a hot pizza from the hot food counter - my rationale being that Americans would call a whole pizza a "pie". Of course this pizza wouldn't count towards my total, but what harm could it do? 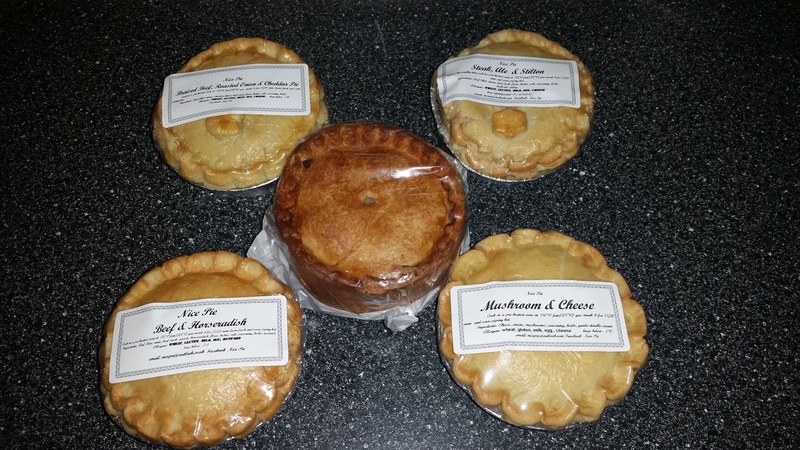 This week Pierateer Sam is looking to eat pies in an unusual way each day. Today sees the pie-nt challenge, so watch the video here.